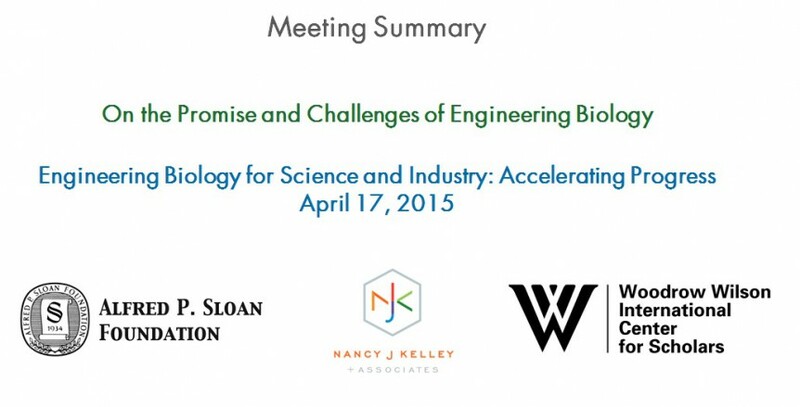 The Engineering Biology for Science & Industry: Accelerating Progress meeting in April had a standing room only crowd, with enthusiastic dialogue about what is required to accelerate progress in engineering biology, and lots of support for moving forward. The discussions were captured in a meeting summary and can be found here: http://nancyjkelley.com/wp-content/uploads/Meeting-Summary.Final_.6.9.15-Formatted.pdf. In addition to the numerous comments from the panel discussions described in this document, we also created 15 video clips featuring interviews with participants of the meeting describing in their opinion, the biggest opportunities and challenges surrounding engineering biology. This content, including ongoing industry news and videotaped interviews with meeting participants, is available to the public at http://nancyjkelley.com/engineering-biology and http://www.synbioproject.org. Check back regularly for ongoing developments. The Woodrow Wilson International Center for Scholars and Nancy J Kelley + Associates will host a follow on planning meeting at the New York Genome Center just prior to the SC2.0 conference on Tuesday, July 14th (all day) and Wednesday, July 15th (one half day). Many thanks to NYU Langone Medical Center, Twist Bioscience, Gen9, Modern Meadow, New England Biolabs, Novartis Vaccines & Diagnostics, Spencer Adler, Bergeson & Campbell, and Epibone for stepping forward to support the cost of this meeting. We have identified some large pools of federal funding ($50 to $170 million over five years) that present potential opportunities for the support of engineering biology in the event the community can organize itself to apply. We have also identified other programs of support that can support policy development, public engagement and ethical and security issues. It is critical to discuss all of this and begin some road mapping activities in order to be ready to take advantage of these opportunities and work with a new administration after the next election cycle. An agenda for the meeting can be found on the meeting website here. Speakers will be announced shortly.